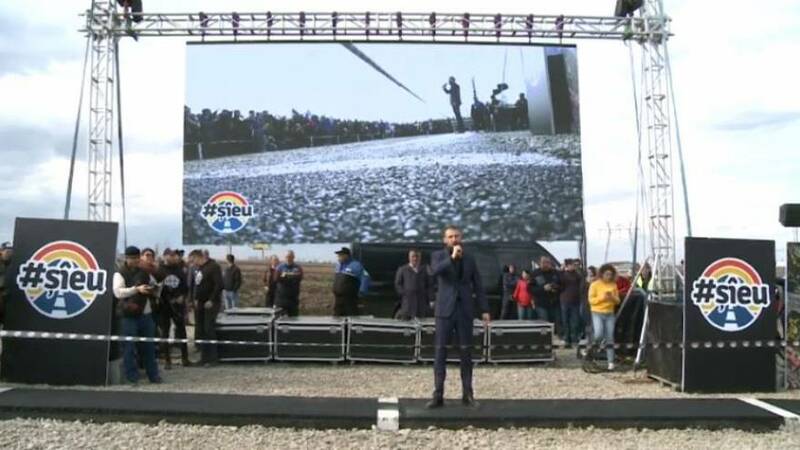 A businessman in northeastern Romania has built the world's shortest highway — measuring 1 metre — in protest against the lack of road infrastructure in the region. "We are the poorest region in Europe. And I want highways here, in Moldova, in my region. Here, in Suceava, in my city!," entrepreneur Stefan Mandachi told Euronews. The businessman said he grew tired of broken promises made by the government over the last 30 years to improve road infrastructure, so he acted himself and invested €4,500 into the project. Romania’s highway network is only 805 kilometres long and road construction in the country is going at a very slow pace. Authorities promised 118 kilometres will be ready by the end of 2019. Mandachi has called on the help of other businesses and people to support his “Romania wants motorways!” campaign. So far, it has proved popular with tens of thousands of people across Romania coming together to offer support. The 1-metre highway near the city of Suceava was officially opened in the presence of the local mayor, Neculai Miron, on Friday. "We have asked repeatedly for infrastructure projects financing, but we got very little, so we had to manage at a local level. For the communal infrastructure we got some European funding for a 5.2 km road and for the rest of our projects we will use the local budget," Miron said. According to The European Commission, Romania tops the blacklist of road casualties in the European Union. In 2017 alone, more than 1900 people were killed on countryside roads. Experts say this is due to the lack of modern infrastructure. Watch the video in the player above to see the 1-metre highway.